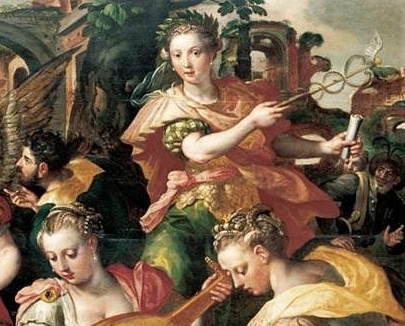 Rhetoric - detail from Martin de Vos, "Allegory of the Seven Liberal Arts," Public Domain, Wikimedia. “What is rhetoric?” you may ask. There are many definitions available. As a scholar of rhetoric, I offer my current definition. Rhetoric is the study and practice of communication that persuades, informs, inspires, or entertains target audiences in order to change or reinforce beliefs, values, habits or actions. Rhetoric is basically the strategic use of communication to accomplish purposes with target audiences. It can be used for ethical and unethical purposes, but ought to be used for good ends and to enhance truthful and honest messages. Rhetoric is defined by its function, not by a communication medium, topic, or social location. Rhetoric is not limited to writing and speech, but occurs through all media and genres. Rhetoric may be performed and appreciated in music and the arts, in greeting cards, Twitter posts, advertising, architecture, and elementary education. Rhetoric is not restricted to politics and public discourse, but is potentially an aspect of communication on every topic and every social situation. Therefore its strategies must also vary by situation and audience. Rhetoric need not have an external, human audience. One could even say we persuade ourselves through our internal decision-making processes. Spiritual practices often include divine persuasion and communion through prayer. Rhetoric functions even where it is not announced or acknowledged, and is even used by those who deny it and defame it. Most people practice rhetoric all the time without consciously applying it or studying it, just as we can all think without having to study philosophy or psychology. Because “rhetoric” has often been portrayed as empty, false, argumentative, or manipulative, many people dismiss it, avoid it, or blame it for many ills in the world. However, rhetoric, like many other human arts, achieve its greatest purpose when used to communicate and enhance truth, mutual understanding and beauty. Sometimes communicators expressly deny that they are using rhetoric. However, the most powerful forms of rhetoric are those that hide their own strategies and intentions. Many people accuse others of using rhetoric as if using it is not ethical or appropriate. However, even the condemnation of someone else’s rhetoric is itself an act of rhetoric persuading you to agree with their judgment. Individual, everyday practice and reflection on one’s own communication — We learn through painful trial and error and by reflecting on what we observe. We adjust our own rhetoric sometimes without even being aware of altering our strategies, and other times we use conscious effort. Rhetorical enculturation and popular rhetorical advice — We can find examples and advice about effective or ineffective rhetoric in self-help books, magazine articles, and churches, among other places. Our society continually teaches people how to communicate in certain situations or to achieve certain purposes. Formal study of rhetorical theory, criticism, history, and practice — This is usually facilitated through Rhetoric courses at an institution of higher education, or through a speaking or debate club or corporate workshop that incorporates the rhetorical tradition. University courses usually teach the “rhetorical tradition” represented by a canon of rhetorical theorists and famous orators/writers/leaders. They often engage students in applying rhetorical principles to their production of discourse in writing, speech, or other media. Read more about rhetoric on Wikipedia’s Rhetoric Page. Thanks for your comment Aris. Rhetoric has been defined in very many ways across history and in different cultures. It depends on what you are doing to say that a certain definition is “more useful.” Useful for doing what? I welcome you to post your own definition here or elsewhere. Your key terms sound to me like they are related to linguistics and socio-cultural theory, and I readily admit that my background is not in linguistics, which I find quite dry and technical. I value the combination of agency and language too much to objectify rhetoric as “discourse,” a term which often seems to be invoked in a Foucauldian sense as a linguistic-social-structural phenomenon (like a matrix) without any focus on an individual or collective rhetor with motives that shape discourse (would you call the agent of discourse a “discourser?” no, but in rhetoric one can call them a rhetor). Rhetoric is beyond the scope of any individual theorist to encapsulate or set boundaries upon, but rhetoricians produce rhetoric about rhetoric… our definitions are the territory that we see rhetoric claiming and flourishing within. Visit http://www.libraryofrhetoric.org for more information on specific rhetorical genres as well as articles, books, and websites that deal with effective communication. A definition, like yours, is in fact a rhetorical figure that excludes some things (by some authors hidden in the dark), but do also include and clarify other things. What do You exclude, dear Edu*Rhetor? Let the sunshine in:-). Even though Your definition seem to be a good one, it seem to be a combination and more or less the same like James E. Herrick definition, that he mentions in his textbook “The theory and history of rhetoric” and with a familiar touch of the definition in the book “Persuasion-Social Influence, by Compliance Gaining, Robert H. Gass, & John S. Seiter. Inspired by them, are we? Hello meg. Sorry if I’m replying too late for your assignment. I think the terms will change their meaning depending on the context. Are you writing your composition in a political science class or a rhetoric/communication class? “Political language” in a neutral sense, could mean “language used by politicians” or “language used for political purposes.” In a negative sense, it could be used to criticize a person for improperly “politicizing” a topic that should not (according to someone) be seen or spoken of in a political light. I am also a little confused by the term “versus” in your theme “Political language versus rhetoric.” Who is telling you that there is a “versus” separating these concepts? I am glad that you asked in your question “I should somehow analyse the connections between those two…” Yes there are very strong connections between the two. How can one speak in a political fashion without using rhetoric? If rhetoric is about persuasion and argumentation, and if rhetoric is needed by leaders in order to articulate a vision, how can rhetoric not be a tool used by politicians, political analysts, and policy-makers? Consider the famous Roman orator Cicero, who became the head of the Roman republic (equivalent to a president). Was he not well known as a rhetorician? Cicero wrote dialogues and instruction books on rhetoric, as well as advice on how to run a political campaign. Cicero’s political speeches (the most famous being “against Catiline) became common texts studied by schoolboys who were learning about rhetoric and politics and history (and often Latin as well) all at the same time. i do not understand all the rthetoric going on here but it seems to me like it really just depends on what you are trying to express and or get across to your audience. Whether or not you are a politician or some writer writing an article about something you feel is interesting or just want to express a truth through the freedom of press. Epxlain to me what kind of rhetoric is useful to anyone when the truth is much easier even if it is hurtful. Thanks Julie for your comment. I agree that rhetoric will vary from situation to situation, and “it really just depends on what you are trying to express.” That’s what makes it so challenging; it’s not like a simple recipe. You ask at the end of your comment, “Explain to me what kind of rhetoric is useful to anyone when the truth is much easier even if it is hurtful.” I hope you aren’t implying that rhetoric is an alternative to telling the truth… ideally rhetoric should be used only with true, honest messages, and that is where I believe rhetoric achieves its glory and honor. When you have a message that is truthful but can be hurtful, you often need to think about your rhetorical strategy in order to obtain attention and convey that you have a person’s best interests at heart. Even the simplest “naked” expression of the truth, like “smoking can cause lung cancer,” can be rhetorically crafted and designed for particular situations and audiences. In my eyes, rhetoric is basically the same thing as persuasion. The key word that stood out to me in the definition was “strategic”; because in the article, the author explores how people defame rhetoric even though they may not even recognize they use it themselves. This leads to many ethical accusations, and thus creates an even bigger dilemma involving hypocrisy. The art of rhetoric is practiced everyday by people, though it is not acknowledged. Delving deeper though, rhetoric is not just a classroom subject that is only explored in schools, but is exemplified almost everywhere you look. For example, rhetoric can even be practiced at the tender age of 3 when a toddler is a asking their parents for a toy. Advertisements are a prime example of rhetoric, as the companies who create them are trying to convince patrons to buy their products/services. I do agree that rhetoric can be manipulative, but can also conclude that rhetoric can reveal many truths and should be used in a positive manner. Rhetoric is the use of writing or language in an effective way. It depends what the purpose is and what and how they are choosing to communicate. Depending on the use, the type of language you use could change. From this, it seems that there are many different ways to communicate and they are all considered forms of rhetoric. If there are so many ways to communicate, does that mean that there are just as many forms of rhetoric or do some cross over? How do we know if we are using language effectively? Is it based on how others recieve what we are communicating or are there certain criteria for what is effective or what is correct? I’ve never been one to study rhetoric, (being interested in computer programming doesn’t really call for it all too often) and I’ve always gotten slightly irritated when someone used a ‘devious’ rhetoric trick on me in arguments. My negative stigma towards rhetoric has come from its ability to make me lose arguments and feel like a fool. It’s interesting to see just how broad an area rhetoric covers, and I’m beginning to wonder just how often I use rhetorical techniques unintentionally. Rhetoric has always seemed so foreign and distant, nearly alien, to me and many others. I’m sure that has made an addition to rhetoric’s negative stigma. I think that rhetoric is a very beautiful art because of the innate understanding of it in people who have no idea of what rhetoric is. As much as I prefer computer code to normal language, I’m interested in exploring more about rhetoric. It may very well prove useful in the future. I’d like to thank you for this wonderful and concise definition. I didn’t know the definition of Rhetoric until I read this blog. What strikes me the most about this is that I read other types of definitions and they seemed really complex. But seeing that you put real life situations to compare to Rhetoric, makes it far more interesting and simple to understand. I really lik this definition of rhetoric. But I always thought that rehetoric was, in some was, similar to tone? Or that it is how we each decide to word everything? Such as having a positive Tone is the same as having a positive Rhetoric. Is this true in some ways? But about the article, I had no idea that Rhetoric was something controversial, both frowned upon and looked up too! It seems to hold alot of power, and I find it interesting that we all do it unintentionally. I can definitely see how we each have our own “kind” of Rhetoric (I can definitely see my own), but I am still kind of confused as to what exactly it is, and if it is even definable? Hello edurhetor! I really like the definition of Rhetoric that you made, but I am still kind of confused as to wht Rhetoric actually is. I want to know if Rhetoric is in some way related to “Tone” (since that is how I have always thought of it), and if that means that every individual person has their own “style” of Rhetoric? Besides my question, I really like this post, and find the idea that we all unintentionally (or intentionally) use Rhetoric, without even knowing that we are doing it. I can definitely see my own style of it, and that is why I am confused if Rhetoric and Tone are related in any way! Thanks! Thank you for sharing this information with us. The definition you provided was easy to comprehend. My understanding of rhetoric has increased. I realized rhetoric was a form of communication but my understanding of it being used to trigger a certain response was lacking. I never considered rhetoric being used outside of speech but that was my own folly because after reading your article it is clear that rhetoric can be seen in different areas throughout life such as the media, social networking sites, greeting cards, etc. I am however, interested to see rhetoric in art and architecture. Thank you for sharing! Rhetoric is the way one goes about presenting an idea. One may alter their presentation based on their audience. Rhetoric is used to make a concept or argument more appealing to another person. While using rhetoric, you would not change what is true. Rather, you would adjust the way true facts are explained. This was really interesting. and gave a lot of detail that I have not read in other definitions. the part that really grabbed me was “Rhetoric is defined by its function, not by a communication medium, topic, or social location”. I also imagine this as a more complicated way of persuasion. but the examples that are presented in this text show that there is more to it. everything about this is shows the hard work that’s comes with it. I an really glad I read this for my class because my understanding of it was horrible before and I rarely heard it. I understand more about what rhetoric is and what it is used for in literature. I don’t know if it can only be used for written literature, or if you can also use it in speech? I also think that rhetoric has many different components of speech placed in it to make it what it is. Persuasion, attitude, tone and many other parts as well. I think that if you use and practice rhetoric, you will have many more opportunities in speech. After reading this article, I have a better understanding on the definition of rhetoric. Now I see rhetoric as a way of communication to persuade and inform a target audience. Rhetoric is also a study of communication for others. One question that I have is if there is a certain topic that usually people communicate about or if rhetoric is just an overall way to communicate. Something that strikes me is that there are many definitions on what rhetoric is. Rhetoric is using selective words to create an argument that persuades the reader of something. It the manipulation of words to produce a certain thought or reaction from readers. Depending on how sound an argument is and the subjectivity of the reader, rhetoric may succeed in persuading any belief(s) towards any topic. It is very much used in the political spectrum. It is rhetoric in practice. Using rhetoric is a skill. After reading this article, I felt that I now have a better understanding as to what Rhetoric is. When I hear this word, I usually think of Rhetorical, like a rhetorical question although after reading this, I feel I have a greater understanding of the word. Looking more at the definition of signs of what Rhetoric means it makes me think of being persuasion, but rather on a deeper level. Rather than simply pulling one towards an idea, it rather dives deeper into a situation including things such as values, habits, etc. Looking at Rhetorical studies, I feel that it is interesting that it mainly focuses on ones communication. This greatly intrigues me and make me think of how I should apply these skills to my daily life. To wrap this up, I would like to know how the idea came to be and why? After reading your definition on Rhetoric, it gives me a fully understanding of the meaning. Rhetoric is basically used as a way to influence a targeted audience, in order to change or reinforce thinking, ethics, behavior or actions. It can be used for moral and immoral purposes but in the long run, it should be used to develop honest and sincere messages. It must not be used to tell people what they want to hear, rather cite evidence supporting the status of what has being convey. Rhetoric can be use in a court proceeding during a trial, in which, the trial lawyer would try to induce the intended audience, which is the Judge and the Jury to decide in his favor. To accomplish such goal, the attorney must have a comprehensive rhetorical plan. The verdict in the trial must not be based only upon what can be proven, but what can be proven convincingly. I like this definition but I don’t know how I cant approach this question this question given on my assignment- Discuss how rhetoric tradition can be used in any communication situation? Sounds like a good assignment question. Which communication situation did you choose to apply it to in your paper? Rhetoric is the ancient art of communication, yes. Communication includes a large field of activity, and therefore so does rhetoric.